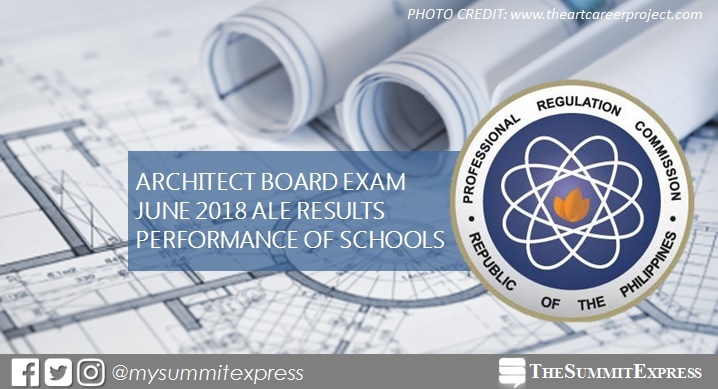 MANILA, Philippines – The Professional Regulation Commission (PRC) hailed the top performing schools in the June 2018 Architect board exam or Architect Licensure Examination (ALE). The results are released on Thursday, July 5, 2018. PRC conducted the licensure exam in Manila, Baguio, Cebu, Davao and Legaspi on June 28 (Thursday) and 30 (Saturday). In the June 2017 ALE, PRC recognized University of Santo Tomas (UST) as the lone top performing school with 83.26% or 184 out of 221 passed the exams. In the June 2016 exams, Technological University of the Philippines (TUP)-Manila topped the schools with 86.79% or 46 out of 53 passed the exams. Monitor this page for the real-time updates on ALE results. Check out also the official website of PRC for more information.